SWQ Christmas Day – 2007 at Longdown, Exeter. The prize of Japanese fabrics in the Sunset Trust raffle was won by one of our members, Joyce Brockman. Overwhelmed by the quantity of fabric and true to her generous nature, Joyce suggested we make a quilt for charity. For several weeks during our Tuesday evening meetings we laid the fabrics out, moving and rearranging colours and patterns, suggestions and ideas flying every which way. Eventually Susan Enderson, who has an innate talent for design, drew up a blue print for a quilt and patterns with a Japanese flavour were gleaned from books and magazines. There are only eight members in our group. Each one chose two or three blocks to sew around the centre piece of a Japanese lady which Susan had made after a workshop with Patricia McLaughlin. When the piecing was completed, the quilt was again passed around each member to add some quilting stitches. Meanwhile the local Girl Guides and Brownies were appealing for help to fund a new hut. We felt it was a worthwhile cause to support and organised the printing of raffle tickets. 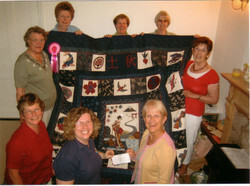 The icing on the cake, however, came when we entered the quilt at the Malvern Quilt Show in May 2009 and won the Fund Raising Trophy in the charity quilts category !